Tel Aviv | Did you learn anything? 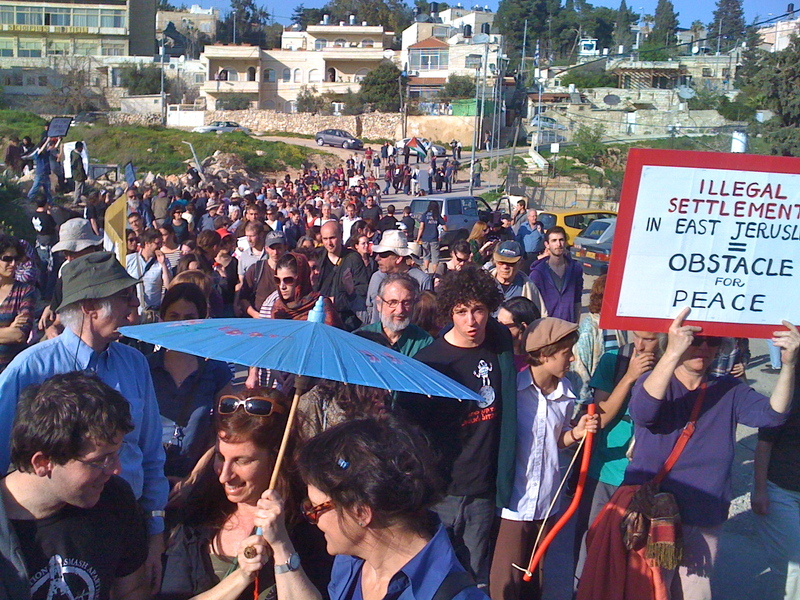 Demonstrators at Sheikh Jarrah. Even the fiercest anti-occupation activists benefit from the state of things. I am on my way to Augsburg, where I will be giving two talks about democratic education. But while my the train heads to Southern Germany, my mind is in the Middle East, where my involvement in democratic education began, where people are killing one another, perpetuating the conflict while convincing themselves and each other that they are acting to end it. After preparing notes for tonight’s talk, I watched Occupation 101, a pro-Palestinian (but not anti-Israeli) documentary. As always when confronted with a non-Israeli, non-Zionist view of the conflict, watching the movie was highly uncomfortable. As much as I read and write about my country’s wrongs, there’s still something deeply unpleasant about having it criticized from without. I found myself constantly checking how much longer the movie runs, but managed to watch through to the end, feeling it was important to see that side of things. The movie is not perfect, but I do recommend it. It illustrates the horrors of our conflict, including Palestinian terrorism, but focussing on the unimaginable ongoing suffering of the Palestinians. Many Israelis are going to dislike what I’m about to write, but it has to be said: Israeli existence is a state of denial. From the violent ideological settler to the fiercest anti-occupation activist, every Israeli profits from the state of things (me and my family included, of course). Not only do we profit, but one had best not think about what previous generations have done to ensure we do so well. It is utterly awful to think about the (few?) massacres and the destruction of (many!) villages1 that led to the fleeing of so many Palestinians and subsequently to the post-1948 situation, in which Jews are a vast majority within sovereign Israel. It is particularly awful to think about because it stands in such stark contrast to the kind of society that has developed within that land in these past 63 years. How can we understand our existence as a fundamentally cosmopolitan, modern, diverse society while thinking about what was essentially an ethnic cleansing, one understood as such by its perpetrators (who may have used the euphemism “Judaization”)?2 And how can our limited human minds possibly reconcile between the terrific life one can lead in Tel Aviv and the hellish desperation of Gaza refugee camps? The answer is that we, all of us, every single Israeli, try to reject agency over the bad things.3 Personally, my way of rejecting agency has been to leave the country and, for a while, try not to know about what goes on there. (This blog is a testament to the failure of that approach.) For many on the Left, the way is to blame the mainstream, or the Right, or the settlers. For the center, I guess the way is to blame the “extremists” on both sides, particularly ideological settlers and Palestinian terrorists. For the Right, the way is apparently to blame the Palestinians and occasionally the Left. But blaming other people, whether or not they are factually to blame, is counter-productive to improving the situation. No one group is entirely to blame for the conflict or its continuation — not the terrorists, nor the settlers, nor the governments, nor Israelis in general, nor Palestinians in general. When we blame others, we deny our own ability to change the situation. This absolves us for all those many moments in which we did nothing to stop the conflict, all the myriad ways in which we benefitted from the situation. It allows us, with clear conscience, to continue standing by while the conflict persists, to continue to benefit from the Israeli economy that thrives on it. Unfortunately, this is necessary to some degree, because tossing and turning all night for shame and guilt certainly won’t help our ability to change things. Make no mistake: one can acknowledge these basic, undeniable realities while holding any opinion on the political spectrum. One may hold that all of these realities are justified because of a Biblical claim to the land or the necessity of a Jewish nation-state. One may hold that these realities were the right and just response to violence and pressure towards Jews and towards Israel. Or one may hold that these realities obligate us to make amends and seek ways to right our wrongs. But we will make no progress while in denial of reality. I don’t know my way around Palestinian politics, but it’s fair to assume similar issues apply there. I imagine those in favor of violent resistance — which keeps the conflict alive and heated — claim they have no choice and are forced into this course of action. I’m sure many Palestinians are in denial of the suffering violent resistance has caused, or simply choose to see that suffering as a necessary price for their liberation. But due to my near-total ignorance, I’ll leave it to Palestinian activists to deal with Palestinian denial and continue to focus on the Israeli side.